By 1932, Universal Studios was becoming the king of horror in Hollywood. Beginning with Dracula, continuing with Frankenstein (see my column #118), Universal was becoming a real powerhouse of horror movies. Sure, Paramount and Warner Bros. were countering with movies like Dr. Jekyll and Mr. Hyde (Fredric March) and John Barrymore in Svengali, but there was no monster like a Universal monster. In 1933 (according to the copyright notice on the film itself—most references say it’s 1932), Universal released what was to be the third in its most famous quadrilogy of horror movies, The Mummy. RKO dipped a toe in with Ernest Schoedsack’s The Most Dangerous Game (Joel McCrea and Fay Wray—not really a horror movie as we’d think of it), and MGM tried vainly with Tod Browning’s Freaks and Walter Huston in Kongo, but let’s face it: Universal owned the day. And Boris Karloff was Universal’s star; his role as Frankenstein’s monster—aided by Jack Pierce’s amazing makeup (remember, that was 1931! )—had made Karloff a star. His roles in The Mummy and The Old Dark House (also 1933) were to cement his stardom; in spite of Lugosi’s iconic take on Dracula, Karloff was the monster of monsters—although in later years he was to take on more “serious” roles, he would always be known as “Frankenstein” (because most people who don’t attend horror movies usually confuse the creature with its maker). The same writer (John L. Balderston) who had written the screenplays (adapted from other works in most cases) for Frankenstein and Dracula was hired to write TheMummy; KarlFreund, who had been well known in Germany for his cinematography (Metropolis and others) and had gained a reputation in Hollywood for such films as Dracula, was given his first shot at direction. Balderston’s screenplay was based on stories by Nina Wilcox Putnam and Richard Schayer (both uncredited on screen). (Ironically, Karl Freund and Boris Karloff both died in 1969.) The cinematography was handled by Charles Stumar, who had been in films since 1917, and who had worked on many movies, including The Hunchback of Notre Dame (Lon Chaney, Sr., 1923) and Uncle Tom’s Cabin, 1927. The producer was—like the previous big-box-office Universal Monster hits, Carl Laemmle Jr. In the 1920s, the USA was ga-ga for Egypt and Egyptology. In 1907, Lord Carnarvon had hired Howard Carter to be in charge of his project, excavating the Valley of Kings looking for undiscovered tombs. There had been a break in excavations for the First World War, then in 1917, Carter went back to it, but they had found little of note. Lord Carnarvon was becoming discouraged, and intended to stop funding the project, but in 1922—during the last season Lord Carnarvon was going to pay for—Carter discovered the most famous tomb in archaelogical history: King Tutankhamen’s tomb, the burial place of the so-called “boy king.” Egyptology became a giant world-wide fad, and by 1931, when Laemmle’s people began working on The Mummy, the fad was dying down. The Mummy, when it came out, didn’t really boost Egyptology again, but it gave Karloff’s star even more of a shine; but thanks to the previous interest in Egypt, the scene and props people were able to give the backgrounds, costumes and props a real air of authenticity. (At a very early age, even before I saw this movie, I was pretty familiar with it due to stills in Forrest J Ackerman’s magazine Famous Monsters of Filmland, and I had noticed that some of the hieroglyphics were not ones I recognized. I had made quite a study of Egypt in high school—especially hieroglyphics [those odd little figures that make up the ancient Egyptians’ alphabet]—and, because I’m more than a bit picky and OCD about certain things, was quite down on the film until I actually saw it, when Balderston (the writer) actually eased my mind about the unknown hieroglyphics. Doctor Muller [in the film, played by Edward Van Sloan] explained that these were pre-Dynastic hieroglyphics and not ones he was totally familiar with. Like The Big Bang Theory’sSheldon Cooper, I was happy again, my OCD had been eased.) 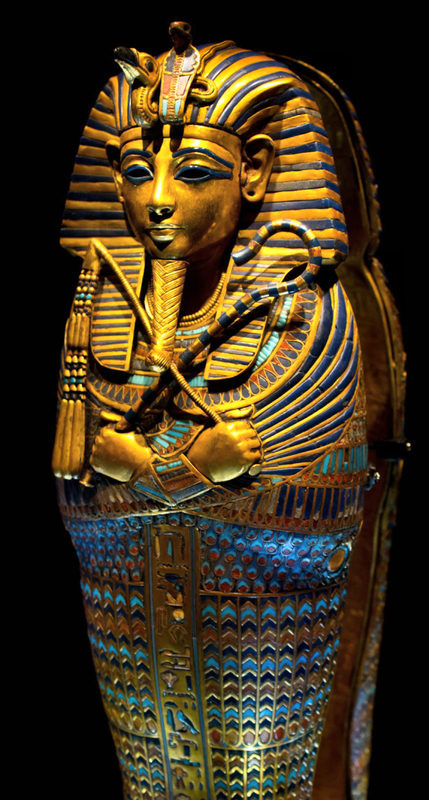 Some of the props, like the sarcophagi, were beautifully done, even though not as elaborate as, say, Tut’s own sarcophagus. I was fortunate enough to visit the King Tut exhibit, including many of his actual artifacts, in Seattle, something around 50 years ago. Anyway, the storyline goes like this. In 1921 several men are working on an excavation in Egypt—Sir Joseph Wemple (Arthur Byron), the leader of the expedition and his assistant, Ralph Norton (Bramwell Fletcher), as well as Dr. Muller (Edward Van Sloan), a noted Egyptologist (and full-on mystic of sorts). They discover an unknown tomb, with a mummy in a defaced sarcophagus and a mysterious box sealed with an inscription that Dr. Muller says promises death and eternal punishment to any who open the box. 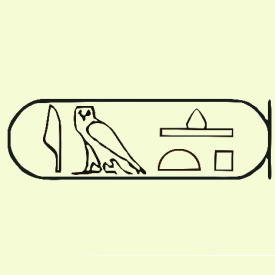 Norton laughs it off, saying “Surely a couple of thousand years in the ground can take the mumbo-jumbo off any old curse!” Dr. Muller discovers that the usual inscriptions on the sarcophagus have been defaced, and that this mummy—the corpse of “Im-ho-tep” (see Figure 1 for the actual hieroglyphics of his name)*–has not been embalmed, and this means that Imhotep was cursed: buried alive and doomed in the next world as well as this one. He says this box might contain the powerful “Scroll of Thoth,” which the goddess Isis used to revive Osiris (King of the Gods) and pull his soul out of the Underworld. He takes Sir Joseph out into the darkness to talk mystic stuff to him after warning Norton not to mess with the box. The opened sarcophagus of Imhotep sits upright against the wall, open, with the unfortunate mummy inside. (Figure 4). While they are gone, Norton—who’s a modern dude and not worried about some ancient curse—opens the box and takes out a papyrus scroll—The Scroll of Thoth! Unwrapping it, he copies down some of the hieroglyphics and begins to read them aloud. As he is haltingly reading the words the camera pans to his right, and focuses in on the face of Imhotep. The left eye slowly opens a crack, then the right; his hands, wrapped in brown, cracked, dusty linen, begin to move. 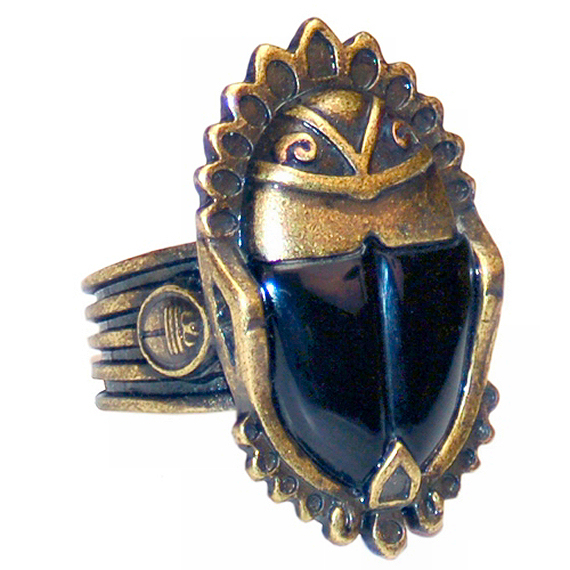 As the camera pans back to Norton, who is obliviously studying the copy he’s made of part of the scroll, we see a dry, wrinkled hand with a large scarab ring (see Figure 6 for a reproduction) on it reach for the original scroll. Norton looks up, starts, and begins to laugh maniacally. What he has seen has obviously, and instantly, unhinged his mind! Camera cuts to the empty sarcophagus with a few fragments of linen trailing off into the darkness to the left of the screen, like toilet paper on someone’s shoe. When Wemple and Muller return, they find him cackling like a madman. “He went for a little walk!” he says, pointing to the door. We cut to 1931; Whemple’s son Frank (David Manners), supervising a dig, is accosted by a strange Egyptian man in a fez; calling himself ArdathBey (Figure 5), he tells Whemple that he knows where there is an undiscovered tomb. Whemple’s crew digs where they are told, and they uncover the tomb of Princess Anck-es-en-amon**; the tomb, the sarcophagus of the Princess and all her accoutrements are taken to the Royal Cairomuseum, where Frank’s father is the curator. One evening, he finds a man, just before closing, looking at the glass case where the mummy of the Princess resides, and is surprised when the man says that they have met before; the man is Ardath Bey. Sir Whemple and Frank close the museum and go to their car to depart. Unknown to them, Bey stays inside the museum, and lights an oil candle on the floor next to the mummy’s case. He unrolls the scroll of Thoth and begins chanting in Ancient Egyptian: we hear “Anck-es-en-amon” over and over. We cut to a reception in a hotel, where a woman named HelenGrosvenor (Zita Johann) is dancing with an admirer; she cuts short a dance and, acting as if she’s in a trance, goes out to the curb, where a taxi bears her to the same museum. She begins beating at the door. Since they hadn’t departed yet, Frank Whemple goes and lifts her up and bears her to their quarters, because she seems to have fainted. (We know why she has fainted; Ardath Bey’s chant was interrupted by a museum guard, and there is a brief offscreen tussle before we hear a grunt and a falling body.) The Scroll is recovered in the aftermath and is put in Sir Joseph’s safe. Long story short: we know that Ardath Bey is actually Imhotep; we find out that Helen is the reincarnation of Princess Anck-es-en-amon, and Imhotep wants to displace the modern Helen and bring back the Princess using the Scroll. See, he and she had been secretly doing the dirty, which was wrong, because she was a Vestal Virgin consecrated to Isis, and he was a priest of Osiris. So when she died, and he was caught with the Scroll of Thoth—trying to raise her from the dead—they wrapped him up, chipped all the stuff off his sarcophagus that was supposed to protect him in the afterlife (the Underworld), and buried him alive, only it didn’t take when young Norton read the passges off the Scroll. Helen doesn’t know what’s going on, and is under the care of Dr. Muller. Sir Joseph has a Nubian slave, played by Noble Johnson—he who was to be the leader of the natives in the original King Kong—and he puts the Nubian under his spell. With the Nubian and Helen going in and out of focus—sometimes she’s the princess, sometimes herself (there is a scene—almost exactly like a scene in Dracula, where Mina Harker tells Van Helsing that she feels “more alive than she’s ever felt”), but obviously falling under Ardath Bey’s influence. (The resemblance to the Dracula scene is very obvious, given that Van Helsing in Dracula and Dr. Muller in this movie are both played by Edward Van Sloan, only in this movie he doesn’t have a crew cut.) In her lucid moments she wants to be rescued from “this thing inside me that isn’t me”—the princess’s soul. Ardath Bey kills Sir Joseph remotely by magic and, with the Nubian’s help, steals the Scroll from Sir Joseph’s wall safe. He takes Helen to his place and shows her, through magic, a scene from ancient Egypt, telling of their love affair. (There were several scenes filmed that didn’t make it into the movie, showing how the two of them had been reincarnated over and over; stills are in the bonus material of the DVD. The only remnant of the unused scenes is an on-screen credit for Henry Victor as “Saxon Warrior.”) Helen returns, confused, to the Whemple place. The “good guys” figure it out; they know that Ardath Bey is Imhotep. Dr. Muller gives Frank an Isis figurine to protect him, saying that Helen didn’t need the figurine because Bey doesn’t want to kill her, he just wants the princess to take over her body. (Helen is also aware that this will kill her as a personality; the body will belong to Anck-es-en-amon.) Frank, headstrong fella that he is, disregards all advice and loops the Isis figurine over Helen’s doorknob; when Ardath Bey attempts to kill Frank remotely, Frank barely makes it to touch the figurine before collapsing, unconscious, and Bey takes Helen to his place, where the Nubian is stirring a giant cauldron of natron. (Natron is a mix of caustic sodas that were used in ancient Egypt in the mummification process, to dry out the flesh.) Bey intends to kill Helen with some kind of sacred dagger, then put her in the natron, and then revive her mummy the same way he was revived, by using the Scroll. The good guys arrive and save the day and Ardath almost literally bites the dust, returning to a dusty skeleton wrapped in rags. 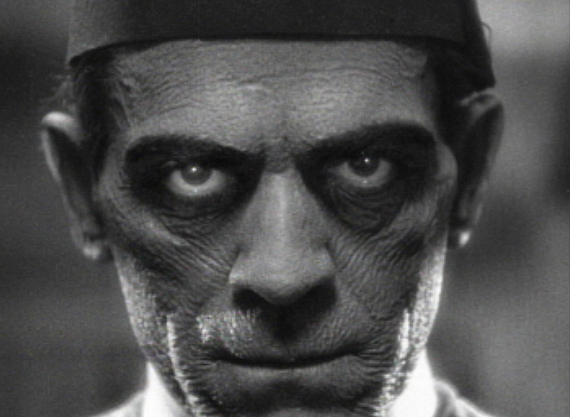 Even though Frankenstein’s monster in the original was a non-speaking role (he did speak in Bride of Frankenstein, however), Karloff had plenty of things to say in this movie as Ardath Bey. 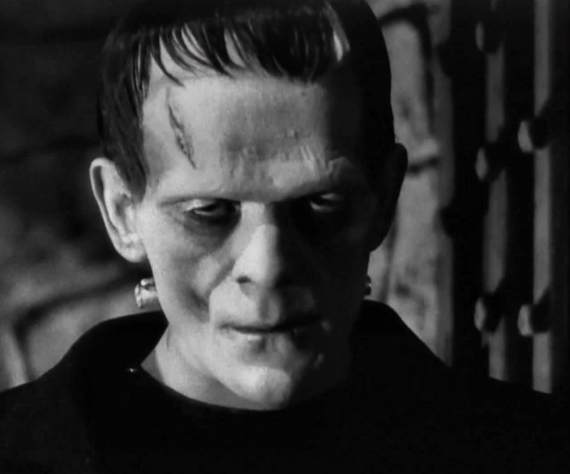 His slow, cultured voice and manner of speaking—and that near-lisp–lent gravitas and a certain scare factor to the role, and allowed him to display more range in his acting than Frankenstein had. Jack Pierce’s Imhotep makeup, which took (according to the bonus materials) eight hours to put on, was heavy and painful—more so than the makeup that Karloff wore for Frankenstein, but Karloff was a trouper. His only complaint was that Pierce—who wrapped him completely in bandages, using real Egyptian linen, as it had a finer thread count—had forgotten to give him a fly, according to Karloff’s daughter, Sara. (Interestingly enough, in the parts of the bonus material which included Karloff’s daughter, she had a bust of Ardath Bey behind her—a very good likeness—sculpted by none other than Tom Savini!) Pierce created Bey’s wrinkles by drawing Karloff’s skin tight and then painting on collodion (from Wikipedia: Collodion is a flammable, syrupy solution of pyroxylin [a.k.a. “nitrocellulose”, “cellulose nitrate”, “flash paper”, and “gun cotton”] in ether and alcohol.) and letting it dry. When the collodion dried, it wrinkled the skin in a very natural fashion. That makeup (as opposed to the mummy’s makeup) only took a few hours to put on. 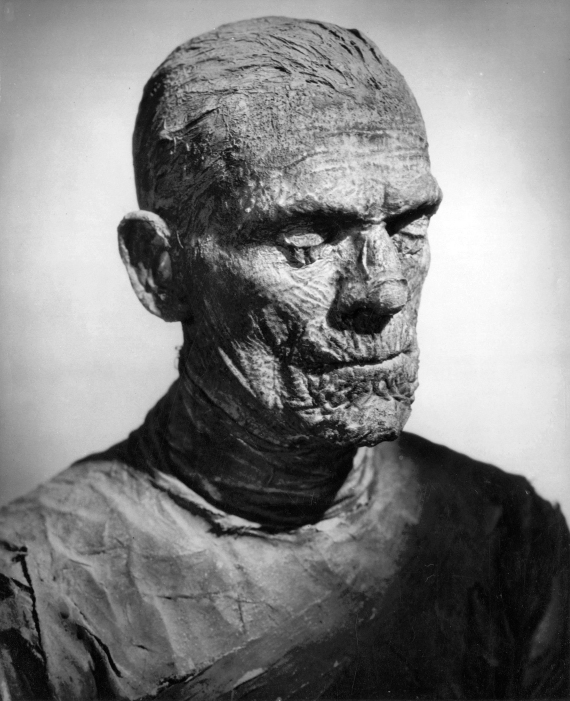 In both cases, there has been no other mummy makeup, either practical or CGI, in my opinion, that matches Pierce’s work. (I once used liquid collodion, built up in many layers and with red ink included, to create a very realistic arm wound, with which I badly frightened my ex-mother-in-law, who was a registered nurse. Collodion is cool stuff to play with!) The mummy’s bandages were also never as well done in the sequels, either—with the last one (Abbot & Costello, see below) having the mummy wear, basically, bandage-shaped coveralls. Pretty shabby work. I never really cared for Zita Johann as Helen; Johann was a fairly well-known Hungarian stage actress (that is, she was Hungarian and was a stage actress, rather than an actress in Hungary). She appeared in a number of Broadway productions and was later married (albeit briefly) to John Houseman (he of The Paper Chase). She seemed to me to be overacting, although I do feel her face—with large, expressive eyes—was suited to the role. The Mummy was a huge success, spawning not only innumerable sequels and unrelated films joined only by having an ambulating mummy in them—notably a number of Hammer films too—the Universal films culminating with Abbot and Costello Meet the Mummy (not really a mummy movie per se, just a vehicle for A&C’s patented hijinks)—as well as, starting in 1999, a series of remakes (sort of) with Brendan Fraser and Rachel Weisz and some spinoffs starring Dwayne (“The Rock”) Johnson and others as The Scorpion King. Durable indeed, this character. *There was a real Imhotep; he worked in the reign of Djoser (2635-2610 BC, also known as Netjerikhet, but I learned him as Djozer in high school—also possibly the origin of the name “Gozer” in “Ghostbusters”?). The real Imhotep (“He who comes in peace”) was the architect—the first architect in history whose name we know—of Djoser’s famous “Step Pyramid,” which came before the better-known pharaonic pyramids. The cartouche (the oval surrounding the name) suggests that he became a king (pharaoh), as a cartouche is usually only used for royalty; a French website says he was a king of the Eighth Dynasty. The reed (looks like a quill pen) is the “i”; the owl is the “m”; the semicircle is the “t” and the square is the “p”… and I’ve not been able to find anything like the other figure. Hieroglyphics were usually written right to left, but you read them in the direction the figures are facing; in this case, left to right. **The real Ankhesenamun (means “beloved of Amon”) was a princess of the eighteenth dynasty, so she and Imhotep (eighth dynasty, remember?) were unlikely to have had an affair. Just thought you might want to know. If you have anything to say about this column, compliments or brickbats, please post your comment here—it’s easy, and you can even sign up to get automatic notifications of new columns! (I do publish corrections when you send me information, and even apologies if I got something egregiously wrong.) Or you could comment on Facebook; I post links every Friday when a new column comes out. My opinion is, as always, my own, and doesn’t necessarily reflect the views of Amazing Stories or its owners, editors, publishers or other bloggers. See you next week!